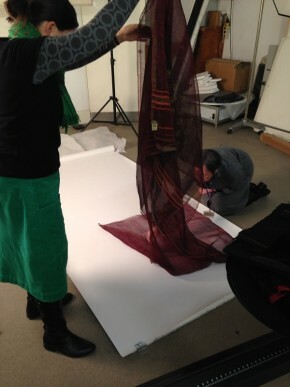 You would think a beautiful textile would be easy to photograph beautifully. After all, the thing is gorgeous! Luminous! Glorious! How could it be possible for it not to look as spectacular as it is? You would be surprised. 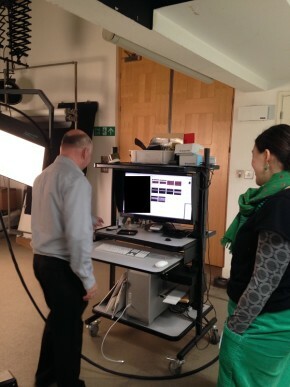 Rounding the bend of the new year, and looking down the barrel of our deadlines, our Fabric of India conservators and photographer have started the process of shooting our exhibition objects. The Fabric of India book is being edited as we speak and, as with all of the V&A’s publications, its informative text will be accompanied by luscious imagery. As we know our fellow textile-ophiles thrive on inspiring images and crisp details, our talented conservators and photographer are working very hard to arrange our fabrics in ways that show off their best features. Muslins are being humidified, chintzes brightened, backgrounds and lighting set up, adjusted, and adjusted again. Everything is being made to look its best. But herein lies the challenge: what if an object’s best feature is that it is so fine it is nearly transparent? Today we wrestled with this exact problem. The culprit? One of my favourite pieces: a super fine sari woven of a black cotton weft and maroon silk warp, with jamdani detailing in gold-wrapped thread. Though it is over 150 years old its gold still glimmers, and even at nearly 7 meters long it weighs practically nothing. Given half a chance it would happily be blown away on a slight breeze. It frequently causes staff to sigh, it’s so pretty. And yet it is camera-shy. 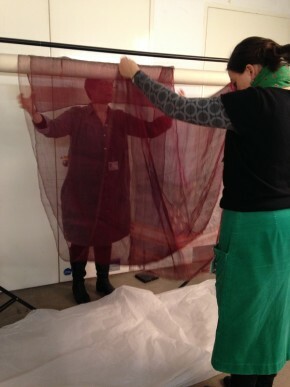 We had instructions that it should be draped and/or ruffled, and we dutifully tried. We initially draped it over a roller folded in half, but found even at four layers thick we could hardly make out its colour, nevermind its details. We re-arranged it – draping and ruffling it a bit more here, then there. Still no better. We tried folding it in eights, but though the colour improved slightly from certain angles, we now had little of its true length to show. Still more draping, still more ruffling… our photographer watching with a frown as our conservators adjusted it again and again. Astoundingly, this lovely thing could not be made to look lovely for the camera. So it was decided that best efforts at draping and ruffling had been made, and it was time to try something new. 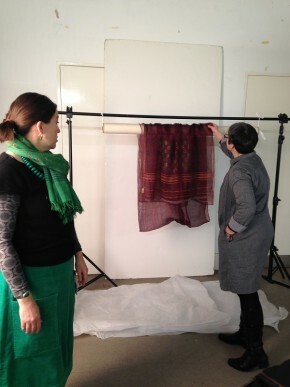 Though as a sari it would naturally drape, we could not show it at its best hanging off a roller. Instead, we tried it laying down. Against a surface its colour suddenly popped, its gold shone, and its texture came to life. 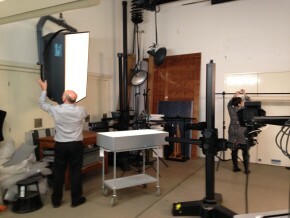 Our conservators fastidiously arranged it with lovely folds and sway, and our photographer looked on it with approval. It really did look truly gorgeous. OK… draped in eights? Nope. We’ve got many, many objects to go – no doubt with their own challenges. Luckily we have a skilled and experienced team who will ensure you get the best images for all your textile-admiring needs. For now though, you’ll have to wait for the book!